This week I have been busy distributing the chickens straw bale wind block. The straw bale wind block that collapsed after the winter snow. 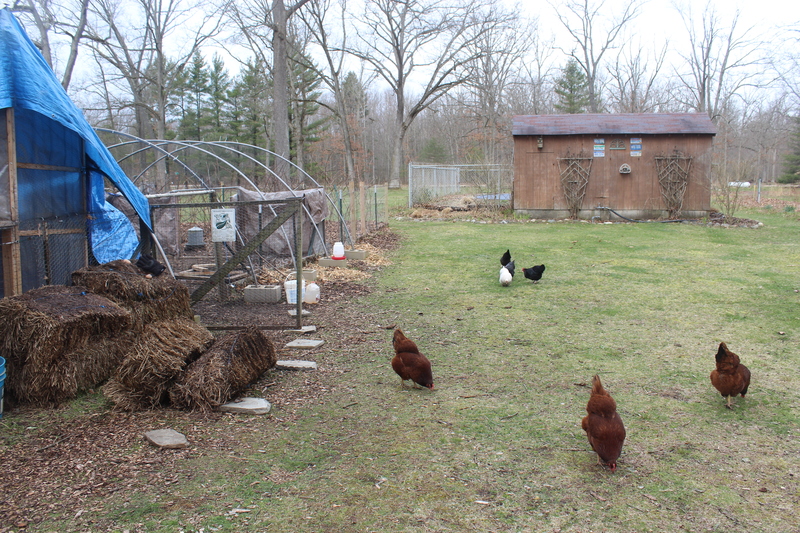 Each fall we set up stacks of square-baled straw around our chicken coop and run with the goal of blocking some of the big winds we get here on the homestead. We live not far from Lake Michigan and we definitely get the results of a lot of lake related winds that we feel on our homestead. Come spring I use these bales as mulch and distribute the wet straw around many plants and trees in the garden and the landscaped beds including our five-year-old baby pine trees. 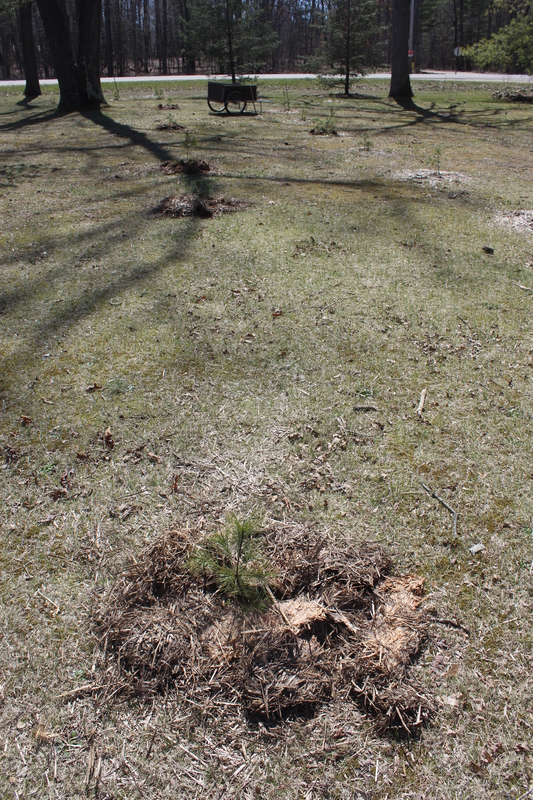 Baby White Pines replaced those that were cut down. As organic material straw will eventually rot and turn into soil, amending the existing soil as they rot. The clumps of straw also hold in moisture from the spring rains which will benefit whatever growing things they are spread around. Our garden cart full of straw on its way to be distributed. This year we were also lucky to be able to be the recipients of three (or possibly four) truckloads of organic materials cut back from our community’s roadside program. These are wood chips, pine needles and other brown and green organic materials. 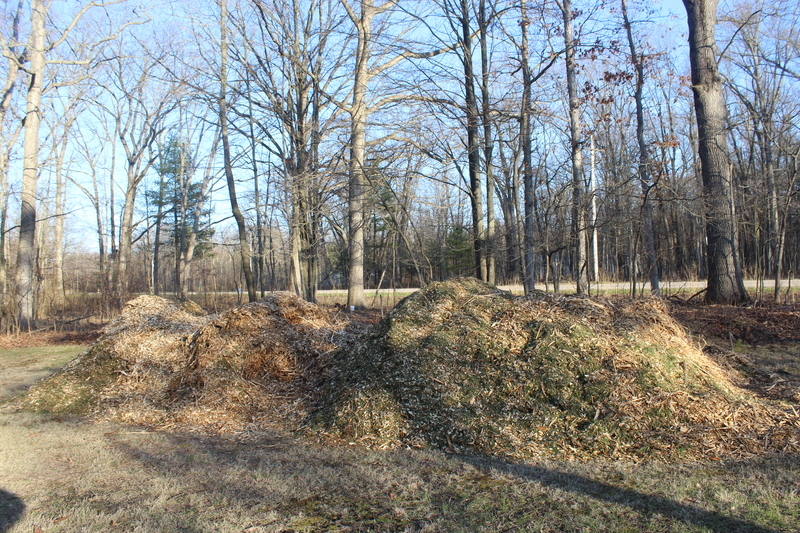 The big pile of organic mulch that needs hauling and spreading. The stars all alligned this spring. I simple stopped and talked to the guys who were cutting and offered our property as the free place to dump them and requested that they be dumped in our meadow. Because they usually have to pay to dump these materials and often we have to pay to buy them; so this was a win for us both. 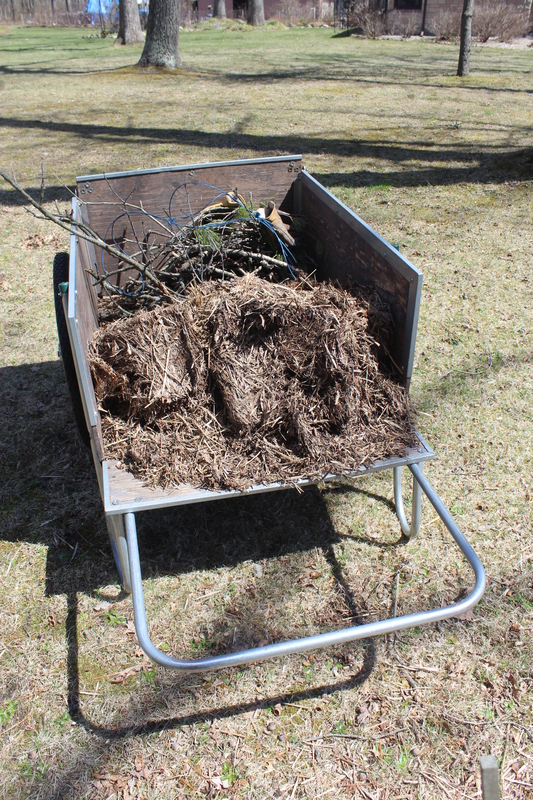 It is certainly a blessing to have these organic materials to work with in our garden, yard and landscaping. Both the straw and the green cuttings will save us money, time and vehicle wear and tear. And having the mulch on site will benefit all the growing things from plants to shrubbery that we have work so hard to plant and maintain. Nothing is wasted here on the homestead!